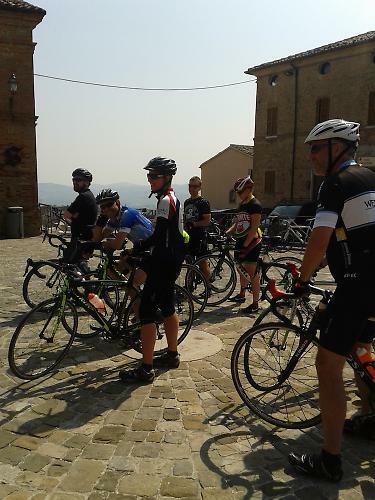 There are many things Italy isn’t short of: hills, sunshine, climbs (lots of those in this part of the country), castles perched atop hills, churches, history and stunning, breath-taking panoramas. The Belvedere Hotel does a brilliant job of catering for cyclists of all levels, from complete beginners to experienced racers. 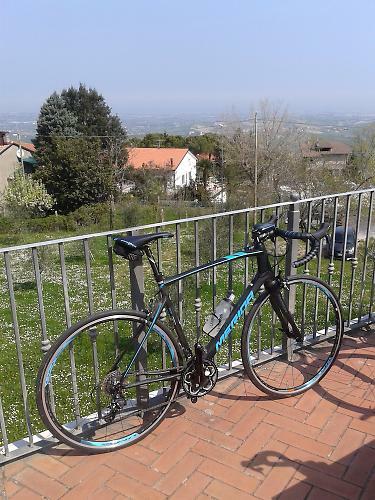 Yesterday, the first day of this road.cc reader holiday in Italy, I tagged along with the panorama group, which on this day was offering a 55km route with an average speed of 20km/h and a reasonable, but not impossible, amount of climbing. And it was very pleasant. Enjoying the company of some very nice people we rolled around the Italian countryside and stopped on many occasions, always with a glorious view of the surrounding countryside, what's not to like. There’s a lot of beauty in this part of Italy, it’s impossible to take a bad photograph, well you would have to try pretty hard to take a bad one. This group, led by the charming Danilo, gave us lots of opportunities to take in the views. Some of the views are hard-earned after a few of the more strenuous climbs, but they look all the better having earned them. Danilo also makes time to impart some of his knowledge of the history of the local area, of the towns and villages we pass through, so we came away from the day culturally richer, as well as a little fitter. The ride also gives us lots of time to stop for coffee. The coffee here is good. Really good. 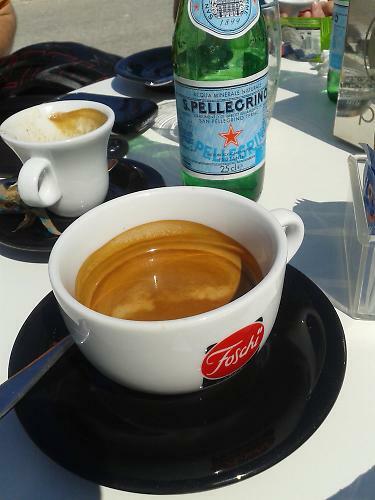 Everywhere you stop, even the most unlikely looking cafes serve up a brilliant coffee. Strong though, you only need a small one. If you like churches, you'll love this one. It was built in 1014, so yes that is very old. It was restored in 1627 and 1794, and it looks in rather splendid condition. 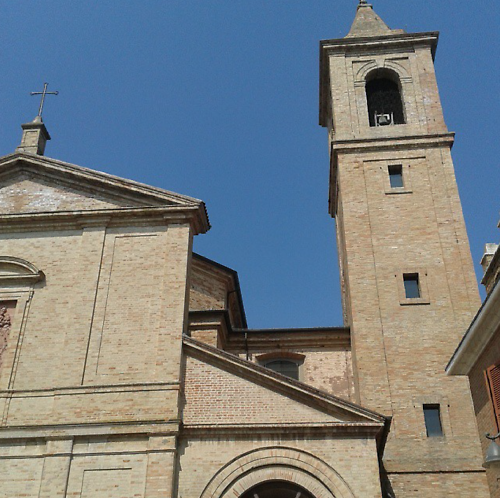 It's called the Chiesa Parrocchiale Santuario Del Beato Amato, in case you're wondering. It's beautiful inside, but as there was a service on I didn't take a photo, so you'll just have to get alone here and see it for yourself won't you. It’s a lovely balance, this panorama group, and everyone seemed to really enjoy it. The pace is manageable, a conversation pace if you like, giving everyone the chance to make new friends, and the hills are tackled at your own pace and effort level. With two guides looking after our group, one at the front and another at the rear, nobody is ever detached from the group, even through the bigger towns which can be a bit hectic. 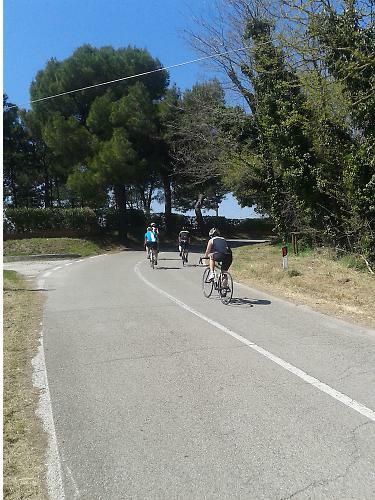 As an introduction to cycling, it really couldn’t be better, and shows that Italy is best enjoyed at a relaxed and comfortable pace, not hurtling along, staring at the stem, in the fast groups. What bike am I riding? I'm glad you asked. I'm on this new Merida Ride 5000, a bike we did a just in on recently so you can get all the details in this article. It's a very comfortable bike, the tall head tube puts the handlebars in a comfortable position and whatever Merida has done to the carbon fibre forks and frame seems to work, because it soaks up all the bumps and cracks in the road a treat. The 25mm tyres also help, I wouldn't really like to ride anything narrower out here. And here is yours truly basking in the sunshine in front of another spectacular view. I know what you're thinking, it's a tough gig, and I'd be lying if I'd tried to convince you otherwise. But you could be out here with us if you wanted to though.